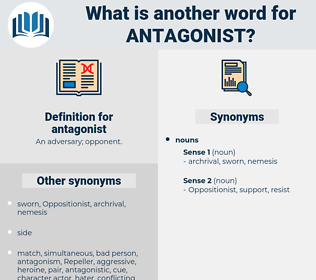 What is another word for antagonist? 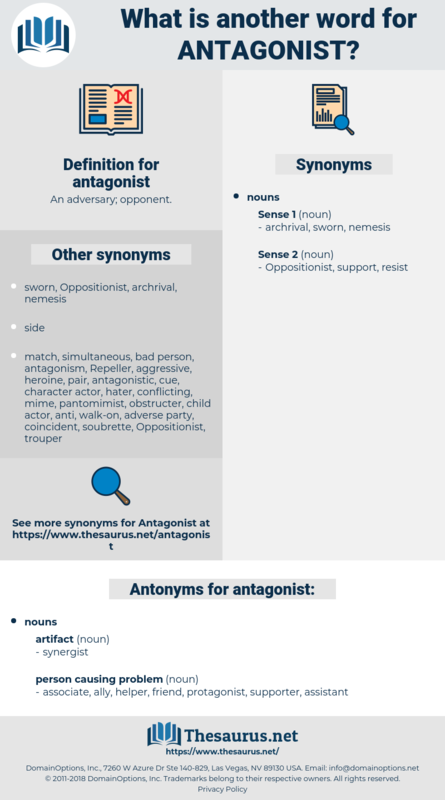 associate, ally, helper, friend, protagonist, supporter, assistant. accessory, disciple, hail-fellow-well-met, well-wisher, collaborator, hearty, exponent, hail-fellow, benefactor, sympathizer, abettor, friendly. Beaulieu anxiously waited the approach of new troops from Germany, to attempt the relief of this great city; and his antagonist, eager to anticipate the efforts of the imperial government, sat down immediately before it. The immediate consequence of this knowledge was a duel, in which Falkenried's antagonist fell. tamoxifen, narcotic antagonist, estrogen antagonist.